A Schema is distinct namespace to facilitate the separation, management, and ownership of database objects. 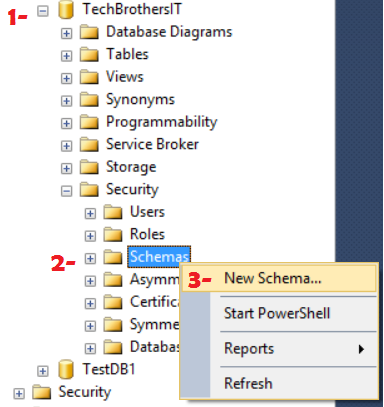 Open the SSMS and you will be going to Database as Schema are objects in the database. Go to Security and then Go to Schema and Right Click and Choose New Schema as shown below. Now you need to provide the Schema name. I used TB as Schema Name and I left the Schema Owner empty, that means that dbo will be owner for this schema. If you would like to choose owner, you can hit search and provide the owner of schema. To create Schema in Database with default owner that is dbo, you can use below script. Let's say If I have a user in TechbrothersIT Database with name [aamir] and I would like to create Schema TB with owner name =[aamir]. I can use below script. 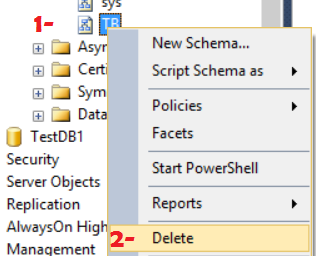 we can right click on schema name in a database and hit Delete as shown below. We can also use TSQL Script to drop the Schema from a SQL Server Database. In below example, I am deleting TB Schema from TechBrothersIT Database.